A few weeks ago, we encountered a problem with the orchestrated creation of virtual machines where “VMM Error 801: VMM cannot find VirtualHardDisk <GUID>” was being reported. The Orchestrator runbook was terminating, failing to create the VM. The service request would fail in turn. I did a quick check up on Orchestrator and Service Manager, no misconfiguration or issues were evident on the runbooks or the request offerings. This was expected since the error was being returned by VMM. I created several test VMs to get some insight into the problem and noticed that the creation was failing on only one of the Hyper-V farms in our environment. The GUID was always the same, it never changed between test runs. Further checking showed that only one node on the cluster was causing the issue. Whenever a VM is created on this node, the creation would fail. Creating the virtual machine directly from the template in VMM fails as well with the same error. Since this node had the lightest load, it was given the best star rating for placement. The node was healthy otherwise and was not reporting any issues. I migrated all roles off the node and created a test VM, it was created successfully. The problem had to be caused by one the hosted VMs. I checked the VMM logs for any errors that popped up when the roles were being migrated. VMM had failed to refresh one of the VMs. The GUID was the same. I created another test VM on the node that now hosted the roles, the creation failed with the same error. VMM was unable to refresh the problematic VM and this was causing it to be unable to create any new virtual machines on the node hosting this VM. When I tried checking this virtual machine properties through VMM, the console was unable to display the properties and it crashed. I checked the VM through Hyper-V Manager. It was running on a differencing VHD with a direct link to the root VHD. This VM was supposed to have a snapshot which was taken around November 2013 when the application was updated. Hyper-V Manager was showing that the virtual machine had no snapshots though. It seemed VMM was having problems refreshing the virtual disks of this VM or viewing its properties when the snapshot configuration is missing. I backed up the VMM database and executed the following SQL query to remove orphaned objects as detailed in this Technet article. The query ran successfully, however, it did not update any rows and the problem remained. 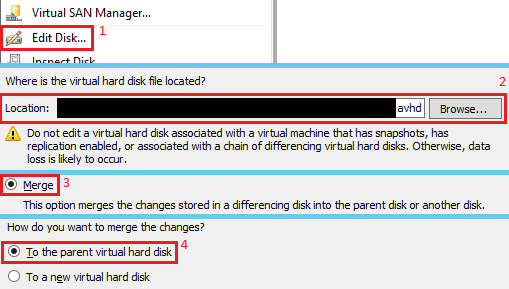 I shut down the VM thinking that a merge operation would take place but Hyper-V did not initiate any such operation. This VM is hosted on a Windows Server 2008 R2 Hyper-V farm by the way, versions prior to Server 2012 do not support online VHD merge. The disks had to be manually merged. Disk editing allows you to manually merge a differencing VHD back to its parent with a simple procedure. 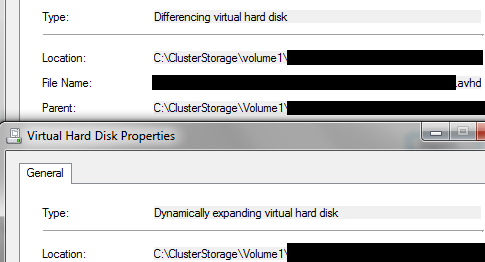 From within Hyper-V Manager, launch Edit Disk. Browse to the location of the differencing disk then choose the Merge option. Finally, choose the option to merge the differencing disk back to its parent disk. When the merge process was finished, a new virtual machine was created and the newly merged VHD was assigned to it. Virtual Machine Manager was now able to successfully refresh the properties of the new VM and the orchestrated virtual machines creation returned to a fully operational state. Caution: In case you have more than one snapshot and they are chained serially, be careful with the options during the merge wizard. Always merge a differencing VHD back to its immediate parent and not the root unless it is the last (oldest) AVHD in the chain. Start from the newest snapshot and work your way back. Implementing SCCM detection clauses using scripts allows an administrator to flexibly define detection methods, especially when dealing with manually defined applications and deployment types. The scripting potential and capabilities are virtually limitless. SCCM supports scripting using PowerShell, VBScript or JScript. Moreover, as shown in the bullets, the setup file was an .exe file. I started by creating a package using the Setup.exe file as shown in the guide published previously. I created detection clauses based on File Detection rules. The application was deployed to several test machines. In this case, the script needs to exit with a “0” exit code and have some data written to the standard output stream to indicate application presence. Exiting without writing anything to STDOUT or STDERR indicates the absence of the application files. The text highlighted in red indicates the full file path that the script will attempt to detect. The main part of the script is the loop function. It will initially sleep for 30 seconds before attempting to detect the file, controlled by the WaitTime constant and using WScript.sleep. If the file is not found, the script will loop back, will increase the value of TotalWaitTime and will wait another 30 seconds. It will continue to monitor and loop until the TotalWaitTime variable exceeds the Timeout value defined. The script will then exit with an exit code of “0” and will write nothing to STDOUT or STDERR. SCCM will interpret this as “application files not found” and will proceed with the deployment. If the file is found, the script will sleep for a minute to allow the background setup to properly finish. It will then output to STDOUT a custom message and exit with a “0” code. SCCM will determine that the application deployment was successful. This will also allow subsequent SCCM Agent application discovery to properly detect that the application is already deployed. The script was tested in a standalone environment and performed as expected. 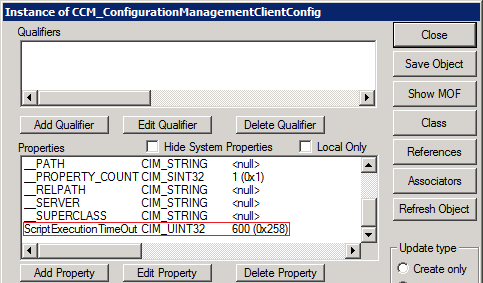 However, when the script was integrated with SCCM detection clauses, it failed to run due to the default timeout that SCCM assigns to scripts. The maximum script execution run time is 60 seconds. Hopefully, the script in this example will help you with custom detection rules in your environment. The variables and constants defined can be changed to values that suit your deployment type. Make sure to test the script before mass deployment.